The Philadelphia 76ers snapped their historic losing streak Saturday night in a blowout win over the Detroit Pistons. Their 26-game skid tied the 2010-11 Cleveland Cavaliers for the NBA’s longest. This masterful tank job has been a lightning rod for praise and criticism throughout the sports world. NBA Commissioner Adam Silver described the streak as “bad for everyone,” while fans in Philadelphia remain remarkably optimistic about the team’s future. That optimism was demonstrated Saturday night when the crowd gave the team a standing ovation for their rare victory. You see, not only have the Sixers positioned themselves for a top pick in this year’s talent heavy draft (and likely a second lottery pick from the Pelicans), but they successfully sold this aggressive rebuilding strategy to a fanatical Philadelphia fan base. To understand how hard of a sell that was, you must first understand their audience. The Sixers have a proud fan base that has cheered for the likes of Dr. J, Moses Malone, Wilt Chamberlain, Charles Barkley and Allen Iverson – whose jersey retirement ceremony was the team’s only sell-out game of the season. Furthermore, Philadelphia sports fans are not like average sports fans. They are loud, at times nasty, and they hate losing more than anything. Think Robert De Niro in The Silver Linings Playbook – that’s who the Sixers had to sell this to. Rookie GM Sam Hinkie accepted this challenge when he joined a Sixers organization still licking its wounds from the Andrew Bynum deal, which is widely considered one of the worst trades in franchise history. “The challenge ahead of us is real, but I am invigorated to build something lasting for Philadelphia,” said Hinkie upon joining the organization last February. He backed up those words by dealing All Star PG Jrue Holiday for injured rookie Nerlens Noel and a future first round draft pick from the Pelicans. This move was as symbolic as it was strategic. It removed any doubt in fans’ minds that the Sixers were planning a comprehensive and likely painful rebuild. The Sixers amped up their marketing efforts to further squash fans’ expectations by launching the ‘Together We Build’ marketing campaign a month before the season started. Advertising for the campaign included the meshing of iconic Philadelphia structures with industrial objects, symbolizing the building blocks needed to work toward greatness. “We are at the foundation of our plan, but the Sixers will lean on one another as a team, taking the ideas and support of our fans and the passion of Philadelphia to press on toward our ultimate goal,” said Sixers CEO Scott O’Neil to kick off the campaign. Not long after the Sixers promoted #TogetherWeBuild on Twitter, fans launched a few of their own hashtags including #TogetherWeTank and #TankForWiggins, referring to Kansas freshman Andrew Wiggins who is expected to be a top pick in the 2014 draft. These indiscreet hashtags demonstrated that fans were warming up to the idea of a losing season. Marketing alone would not be enough to appease Sixers faithfuls throughout an 82 game season. They needed hope, and that hope came in the form of a baby-faced phenom out of Syracuse. Rookie PG Michael Carter-Williams has been the lone bright spot during this historically awful season. He remains a favorite to win NBA Rookie of the Year as he fills up stat sheets night in and night out. 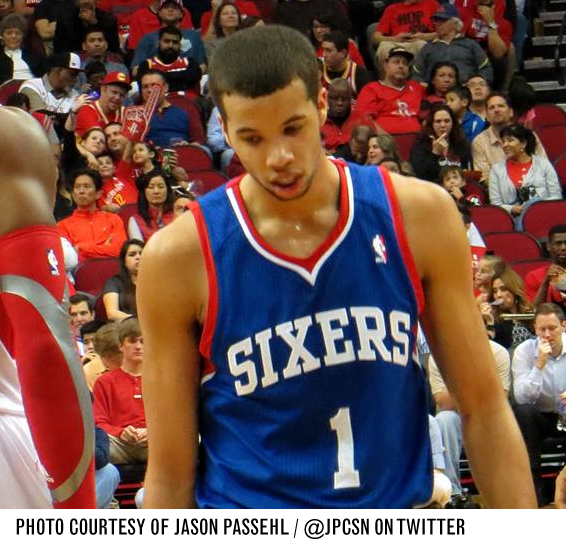 MCW plays with the same grit, tenacity and passion that defines the City of Brotherly Love and its sports fans. Hinkie doubled down on his race to the bottom by unloading Spencer Hawes, Lavoy Allen and former second overall pick Evan Turner at the trade deadline. This exodus of talent was the catalyst for their record-tying losing skid, and it forced MCW and veteran forward Thaddeus Young to carry a patchwork group of unproven players. Rookie head coach Brett Brown, who was largely immune to criticism from fans and the media during the streak, remains confident that the team is improving. “We encourage them to feel good about themselves. We’re the youngest team in the history of the game. With that comes some losing,” said Brown in the midst of their epic freefall. As a primary spokesperson for the team, his honesty and determination has helped to bridge the trust gap between the organization and its fans. Despite the team’s ongoing efforts to communicate their long-term plans, some fans are still skeptical of their tactics. Many are concerned that this losing culture will weaken MCW’s development and carry over into future seasons. “I don’t really worry about what other people say, or the jokes,” said Carter-Williams in an interview after Saturday’s win. “I just keep focusing on the long-term each and every day.” The rookie’s character and maturity, as demonstrated in that statement, will eventually be enough to overcome the fears of those remaining skeptics. The Sixers did everything they could to prepare fans for a bad – very bad – season. Hinkie sold the team on his blue print for success, and as a result this fan base has largely remained loyal and optimistic through this grueling process. Only time can tell how this losing campaign will play out for the organization, but for now the Sixers seem to have sold fans on the belief that they are heading in the right direction. Brian Hart is an Account Executive at Jennifer Connelly Public Relations (JCPR). Follow Brian on Twitter @BrianHartPR.